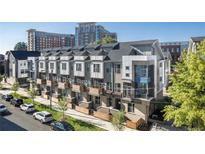 Below you can view all the condos for sale in the South End subdivision located in Charlotte North Carolina. Listings in South End are updated daily from data we receive from the Charlotte multiple listing service. To learn more about any of these condos or to receive custom notifications when a new property is listed for sale in South End, give us a call at 704-350-2820. Walk to meet friends at a moment's notice! MLS#3487068. Allen Tate Center City. Surrounding hot spots include Superica, Barcelona, O-Ku, Atherton Mill, Common Market & more, truly one of the best locations in the city. MLS#3486666. Berkshire Hathaway HomeServices Carolinas Realty. Great location within Atherton Heights with access from rear courtyard into Dilworth / SouthEnd. Convenient parking at front. MLS#3482453. My Townhome. Amazing, 2,000sqft Urban Townhome with all the latest features - 300sqft Rooftop Terrace including outdoor TV, Open Floor plan with large windows for lots of natural light, Plantation Shutters throughout first two floors, 400 sqft 2 Car Garage and all this walkable to light rail, breweries, grocery stores, restaurants and more. MLS#3480240. My Townhome. The Arlington, one of the few high-rise condominiums outside of Uptown boasting a full-time concierge, rooftop pool, fitness center, rooftop terrace with breathtaking city views. MUST SEE! MLS#3480294. Costello Real Estate and Investments. Feel free to just sit in your living room and take in the unobstructed views of the Uptown Charlotte skyline...Fantastic corner unit available at The Arlington, one of the few high-rise condominiums outside of Uptown boasting a full-time concierge, rooftop pool, fitness center, rooftop terrace with breathtaking city views. MUST SEE! MLS#3475896. Costello Real Estate and Investments. Walk to Light Rail, Shops, Restaurants, Breweries & more! MLS#3476371. Helen Adams Realty. Walk to Light Rail, Shops, Restaurants, Breweries & more! MLS#3476353. Helen Adams Realty. Walk to Light Rail, Shops, Restaurants, Breweries & more! MLS#3476337. Helen Adams Realty. Walk to Light Rail, Shops, Restaurants, Breweries & more! MLS#3476331. Helen Adams Realty. Walk to Light Rail, Shops, Restaurants, Breweries & more! MLS#3475815. Helen Adams Realty. Walk to Light Rail, Shops, Restaurants, Breweries & more! MLS#3461808. Helen Adams Realty. Walk to Light Rail, Shops, Restaurants, Breweries & more! MLS#3461811. Helen Adams Realty. Walk to Light Rail, Shops, Restaurants, Breweries & more! MLS#3461809. Helen Adams Realty. All homes include a 4th floor 300 square foot ROOF TOP TERRACE overlooking Uptown Skyline. MLS#3374127. David Weekley Homes. Buyer can still customize interior selections. MLS#3375730. David Weekley Homes.